Iggy's is a modern European restaurant in Singapore and is one of the pioneers of world class dining in the City State. Despite the long presence of Les Amis (being the premier fine dining restaurant in Singapore at that time) and a few others, Iggy's created quite a stir when it opened its doors in 2004 in its previous location at the Regent Hotel; with its innovative cuisine, slick interior (counter seating and all) and immaculate service. It was an aspiration towards European standards of fine dining which brought Singapore's dining scene up a notch over the past half-decade. It has consistently been ranked in the San Pelligrino World's 50 Best Restaurants List in the past few years, most recently achieving its highest position at 27th as the best restaurant in Asia outside Japan. Iggy's recently moved from its Regent Hotel location to larger premises at the Hilton Hotel. We had enjoyed dining frequently at its former location and hence were looking forward to visiting its new restaurant for the first time. The old Iggy's was known to have intimate dining spaces; with the counter seating where one could interact with the sommelier (Iggy's original idea for his restaurant, I believe), a private and quiet room which could take 3 tables of 2-4 persons, and a cozy 'library' dining room. The new restaurant is considerably larger. We did not take a look around but was ushered into what we thought was the main dining room. It was quite large and spacious but was rather noisy. We were seated near the entrance to the kitchen, which had a glass sliding door which allowed us to look into the kitchen. Though this was intended to give diners a view of the kitchen, especially the serving counter where the chefs would garnish each dish before the waiters took it out to be served, it also had the annoying result of diners sitting nearby getting periodic blasts of warm air and kitchen noise whenever the sliding door opened. Iggy's only had one menu for dinner, and the waiter would take note of any food allergies or preferences when taking orders. It had a much improved wine list (previously Iggy's was limited by its wine selection, possibly because of the lack of space in its former premises for a proper cellar) with some decent Burgundies and Bordeauxs on offer. We picked out a 2004 Vosne Romanee 1er Cru Les Beaux Monts from Domaine Bertagna which was full-bodied and delicious. We were thrown slightly by the non-conventional sequence of the meal. We had expected to gorge ourselves on the bread as we normally do, but were told that bread would only be served after the crab course. 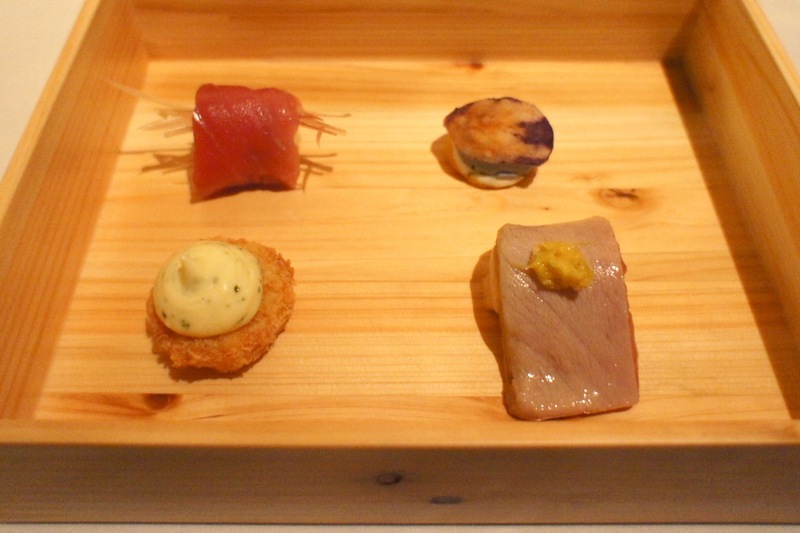 For the amuse bouche, it was a bento box of tuna and seared tuna belly sashimi with potato croquette and a crisp with sour cream spread. Each piece was to be eaten by hand and it was very good. We particularly liked the crisp with sour cream. For the first course, it was the Eel: Caviar, Yuzu and Silver. 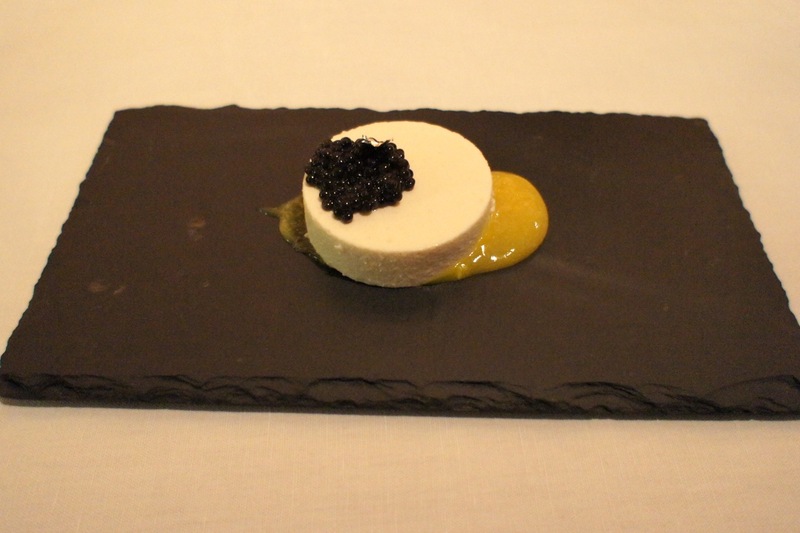 Essentially it was an eel pate topped with Oscietra caviar with yuzu sauce. This was excellent. The eel pate was not too overbearing and managed to accentuate the taste of the caviar. 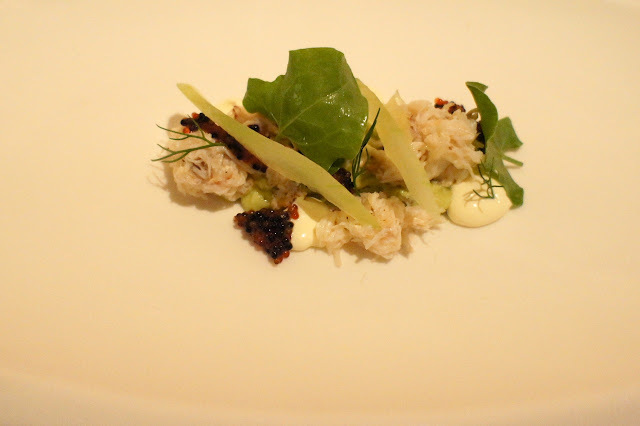 Next was the Crab: Avocado, Cucumber and Fish Roe. At first bite, this was very cold and refreshing, with the crab meat, fish roe, cucumber puree and mayo, but I was struggling to finish it at the end as it was rather insipid despite our positive first impressions. This could have been better as an amuse bouche than an entree. 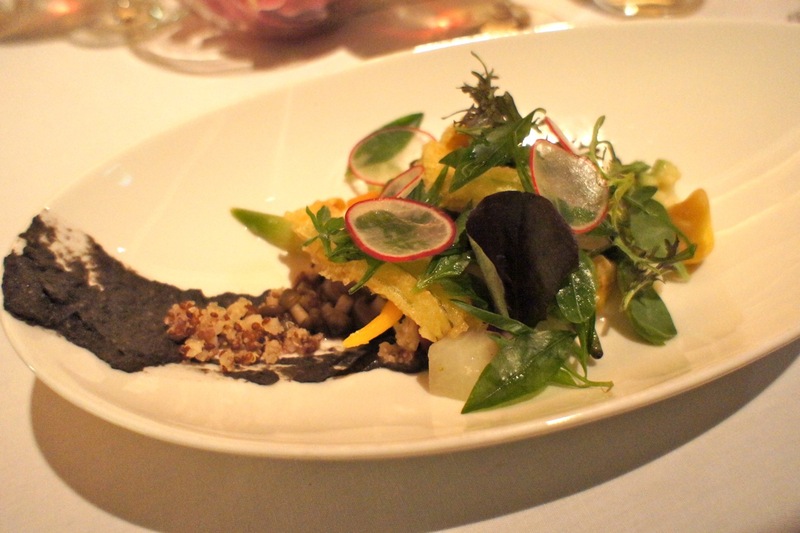 The last entree was the From the Garden: Organic Seeds, Leaves and Blossoms. This was not dissimilar in concept to the Hajime specialty (refer to earlier review: Hajime), with 34 different vegetables vs 66 at Hajime, though the execution was way off. The Hajime dish consisted of raw vegetables, nuts and petals, and the vegetables were fresh and crunchy, whereas the Iggy's one was soaked in oil (some vegetables were breaded tempura-style) and juices, causing the leafy greens to be soggy. Moreover, in the Hajime concoction, you could almost taste each and every vegetable/nut/petal and its flavours, but in the Iggy's version, the tempura overpowered everything else and the vegetables and petals tasted more like accompaniments rather than the main ingredients. 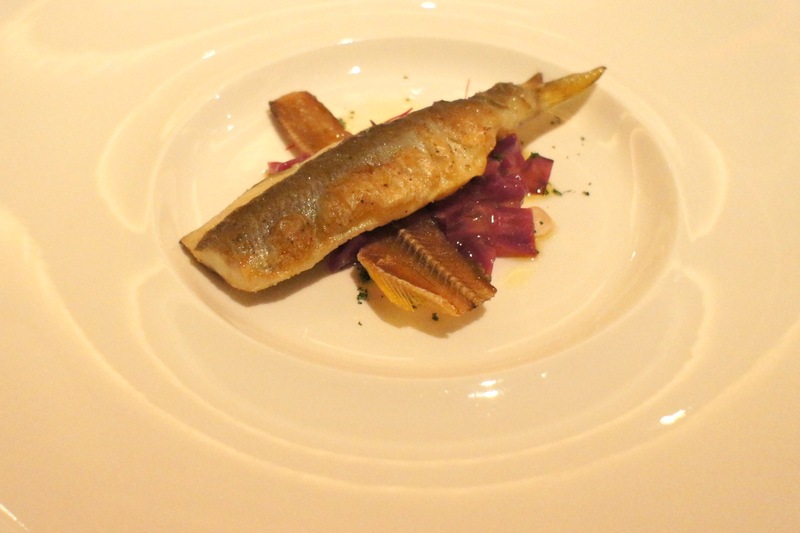 The Ayu: Red Cabbage, Sago and Pemod was better. The fish was fresh and tasty and we also enjoyed the cripsy fishbone. However, the red cabbage and sago did not add much to the dish and was superfluous. We also had an issue with the serving of this dish; the kitchen served this with the fish too hot. They should have let it sit in the kitchen for a few more minutes before serving it. We burnt our tongue with our first bite. 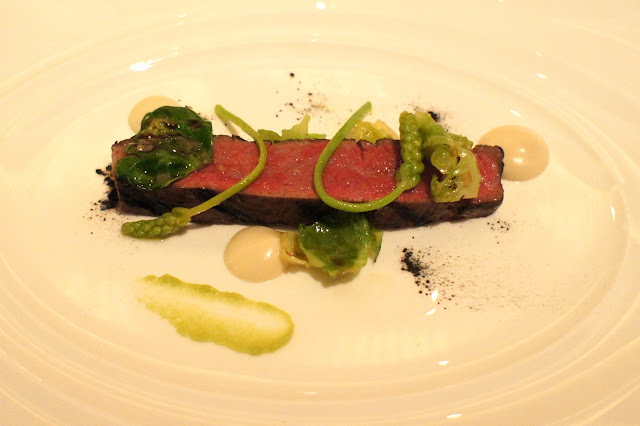 The meat course was the best course of the evening; the Wagyu Flank: Pink Garlic, Brussel Sprout and Ash. The meat was superb and perfectly seared. The ash was a nice touch as it gave the beef a burnt flavour. Again we felt that the brussel sprouts were somewhat unnecessary as it was slightly soggy and didn't improve the dish in any way. 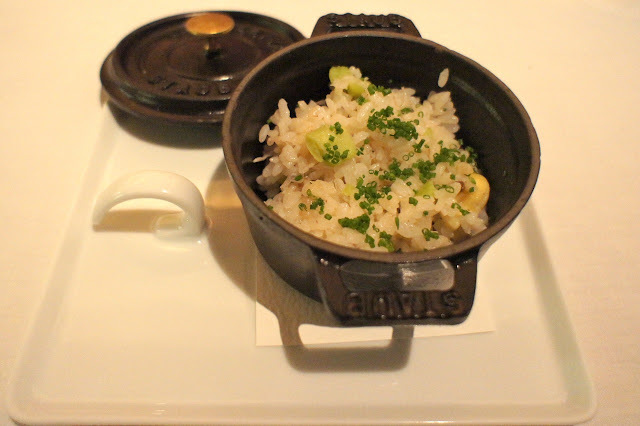 Finally, the Shirasu: Fava Beans, Koshihikari Rice and Sansho. This was the most puzzling dish of the dinner. It was essentially Japanese white rice in a Cocotte (which I'm sure wasn't used to cook the rice) with a few pieces of fish and some fava beans. It was tasteless. It reminded us of a typical Chinese 10 course dinner where the rice is served last in case the diners were still hungry. The reactions of the other diners in the restaurant were similar; there were giggles and gasps of incredulity from the other tables. 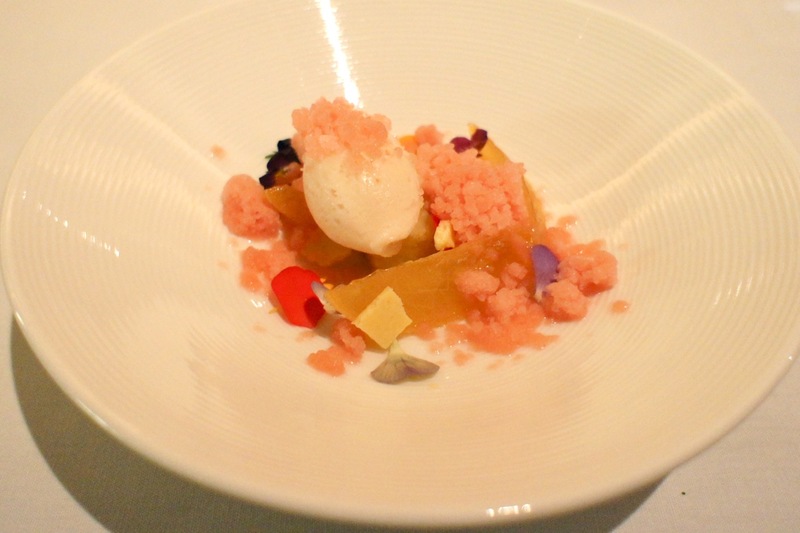 For dessert, we started with the Peach: Rosemary, Verjus and Fizzy, which was a combination of ice-cream, sherbet, a few pieces of peach and some flower petals. It tasted as unimpressive as it looked. Finally, the Passion Fruit: Coconut, Banana and White Chocolate. This was very good. The passion fruit was in the form of a long strand of jelly, while the coconut was a hardened foam. 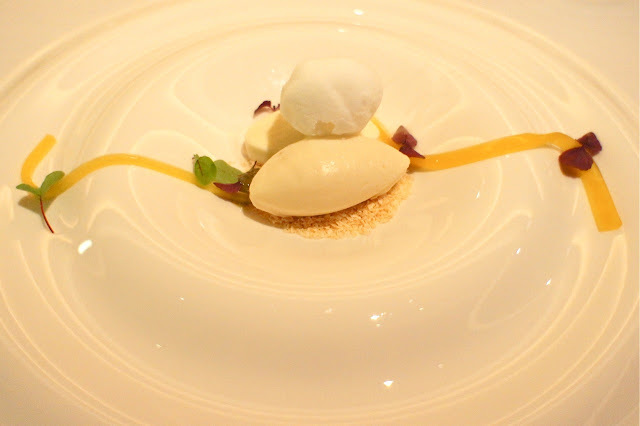 The banana was the sorbet and the white chocolate was a pudding. This was quite interesting and tasted good. For visual effect, this dish was served with coconut water chilled with liquid nitrogen and released from the plate as a white smoke. 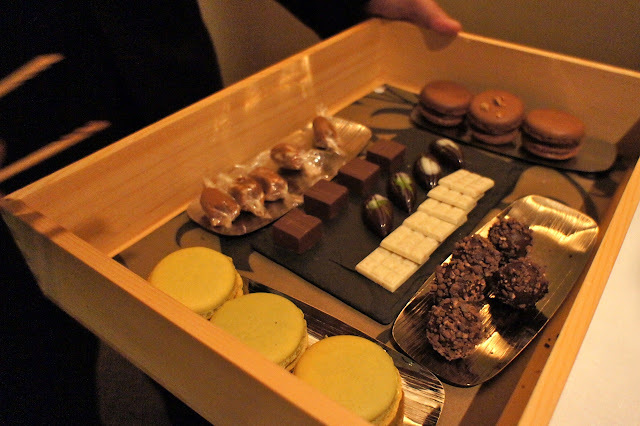 Petit Four was a box of a selection of sweets and chocolate. 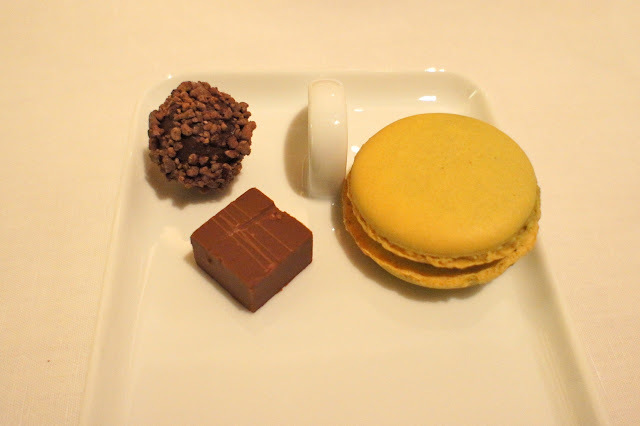 I tried the large goat cheese macaroon which was quite interesting. The rest of the chocolates were also quite good. In summary, we were quite disappointed by our meal at Iggy's this time, as we have always had fond memories of our meals there (when it was still at the Regent). Somehow, some of the magic is gone. In the past, Iggy's kitchen would be able to whip up some of the old favourites created by previous chefs like Chef Dorin and Chef Gunther, but the new menu this time round seemed to lack any real depth and foundation in its execution. It's obvious that Iggy's sorely lacks a head chef who has had solid classical training in the established international culinary institutions. Moreover, the service levels seem to have dropped as well. 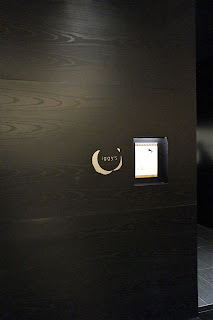 The old Iggy's was formal yet discreet, but the current set-up had too much of a casual feel to it. There was a haphazard way in which the tableware was presented and the food took way too long to be served. For such a short and simple menu, the entire meal took almost 3 hours. 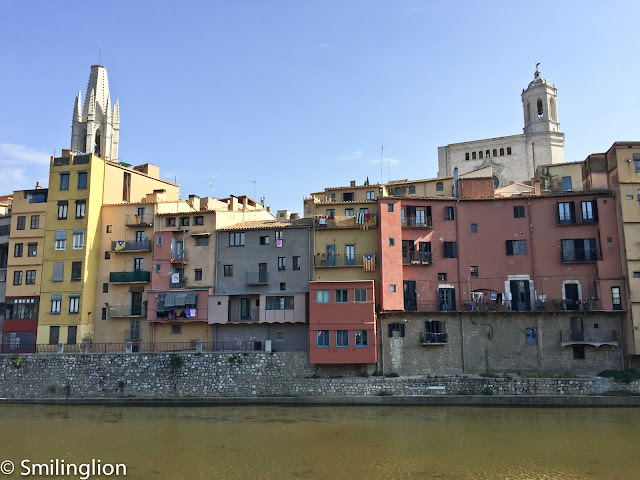 A meal at this restaurant really destroyed any credibility the San Pellegrino World's Best Restaurants list had with us. Iggy's was placed number 27, ahead of La Calandre (at no. 32: La Calandre), Dal Pescatore (at no. 38: Dal Pescatore), Hibiscus (at no. 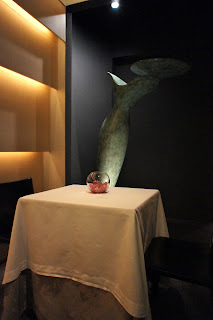 43: Hibiscus), Robuchon (at no. 72: Robuchon), Caprice (at no 76: Caprice), Le Meurice (at no. 97: Le Meurice), amongst others. A meal at Le Meurice, the lowest ranked in the names above, would make it very clear to anyone that it cannot be right.